Macrophage engulfing bacterium. 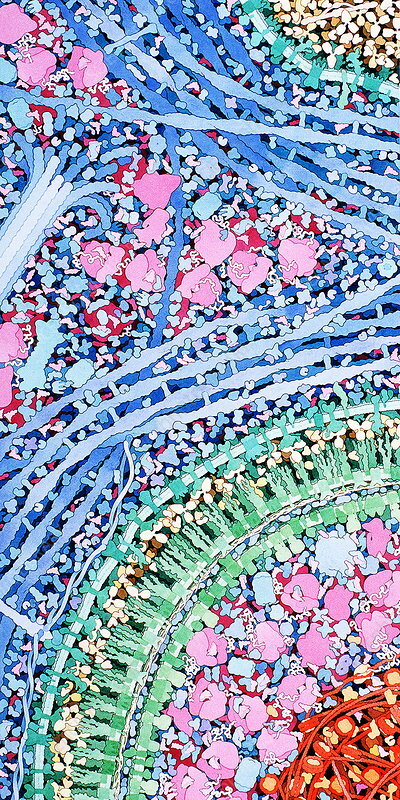 Artwork of a section through a macrophage (center) engulfing a bacterium (lower right). The macrophage cytoplasm (blue and purple) and cell membrane (green/blue) is seen here on the surface of the bacterial cell wall (green). Within the bacterium is its cytoplasm (purple) and nucleus (red and orange). At top right is the blood serum (yellow, brown). Macrophages are a type of white blood cell (leucocyte) which defend the body against invading micro-organisms. When a macrophage encounters a pathogen, it engulfs and destroys it, a process called phagocytosis. This image is the second of three, see also P276/201 & P276/203.